I won one of the great contests on My Mom Shops while I was in Jasper/NICU limbo. It was a nice treat in a pretty crummy week! 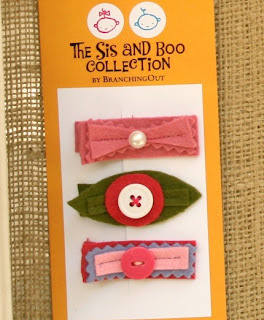 The prize was a set of beautiful wool felt barrettes from Etsy store BranchingOut. This one is probably my favorite. She lasted almost an entire trip to the zoo without taking the barrette out– a record!! !